Purchase a Shock Top beer to receive a Game Piece from your server then enter the Shock Top Shock Scratch Win Sweepstakes at shocktop.com/shockscratchwin for your chance to win Shock Top for Life or other great prizes. Who Can Enter? 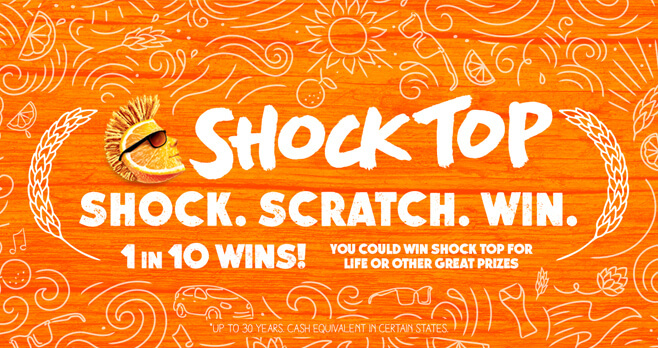 The Shock Top Shock Scratch Win Sweepstakes is open only to legal residents of the 50 United States and the District of Columbia (excluding residents of New Jersey and Texas), who are at least 21 years old at the time of entry. When To Enter? Sweepstakes begins at 12:00:00 a.m. EDT on May 1, 2018 and ends at 11:59:59 p.m. EDT on August 31, 2018. What Is The Sweepstakes Prize? The Grand Prize consists of Shock Top for Life.